The smell of roasting Spring Lamb, with garlic and rosemary, creates one of those food memories that can take your mind back to your childhood and make your mouth water at the thought of it! 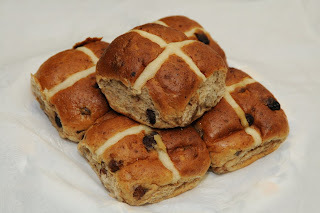 Easter Sunday was always a big occasion in our house when I was growing up as Lent was finally over and we hadn't eaten a sweet thing for the last 40 days! 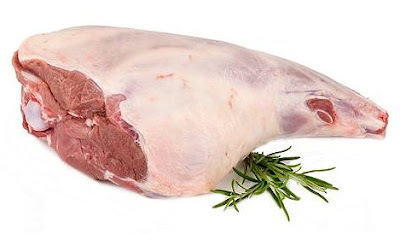 The history of the Easter Sunday Roast Lamb goes back to the biblical Passover of the Jewish people. A sacrificial lamb was roasted and eaten with unleavened bread and herbs in the hope that the angel of God would "pass over" their home and bring no harm. Christians often refer to Jesus as The Lamb of God and as religions merged, lamb became a traditional meat for Easter Sunday. 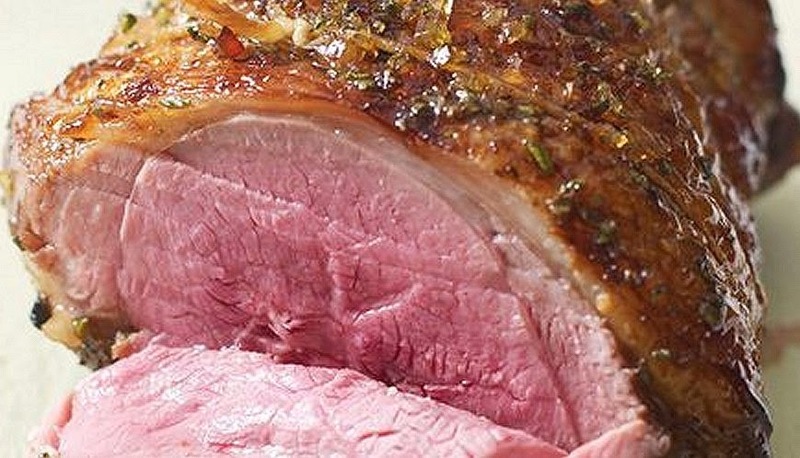 Here's my recipe for a delicious Roast Leg of Irish Lamb with fresh homemade mint sauce, roasted vegetables and champ potatoes with real roast gravy. 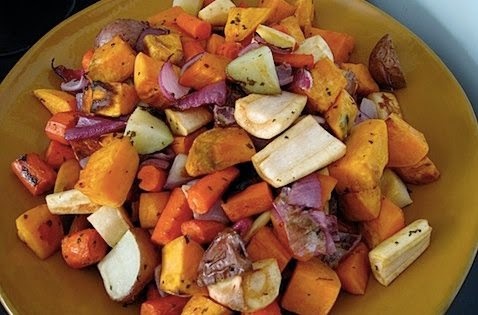 If you make all this for any Sunday dinner, you'll certainly impress your guests! 1 Leg of Lamb - on the bone is better because the bone will add even more flavour as it cooks. Pre-heat the oven to 180°C. Place the Leg of Lamb on a roasting tray. Score the leg of lamb with a sharp knife making 5mm deep incisions through the skin and push the garlic cloves and sprigs of rosemary into the cuts in the meat. Rub the butter all over the leg and sprinkle liberally with freshly ground pepper and sea salt. Cover in tin foil and cook the lamb for about 1 hour 20 minutes. Spoon the juices over the meat every half hour. 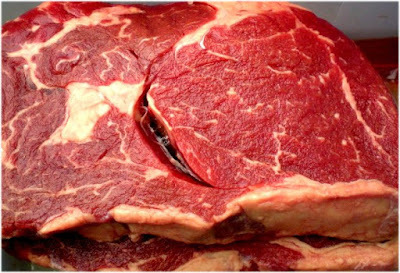 20 minutes per pound (½ kg) will give you a lovely pink medium-cooked meat - but adjust the timing to how you like your own meat cooked. Take the tin foil off for the last half hour to crisp up the skin. When it's cooked, transfer the lamb to another tray and cover it with a clean dish cloth, to rest for about 10 minutes, before you cut it. This allows all the muscle to relax, keeps the juices from flowing out and the meat really juicy and tender. 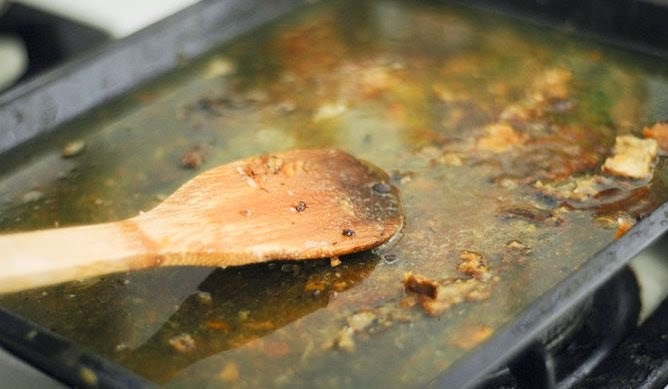 To make the gravy, place the roasting tray on top of your stove over a moderate heat, use a scraper to lift all the tasty residues off the bottom of the tray and let the juices caramelise a little for about 1 minute. Add a pint of boiling water. Bring this back to the boil over the heat and let it reduce down by 30%. Sprinkle a little flour on to the tray and whisk it in to the juices. Let it bubble away for another minute and this will thicken up the gravy. You can add a drop of Browning, if you wish. Strain the gravy into a warm serving jug. Combine the water, sugar, vinegar & lemon juice in a small pot and bring back to the boil. 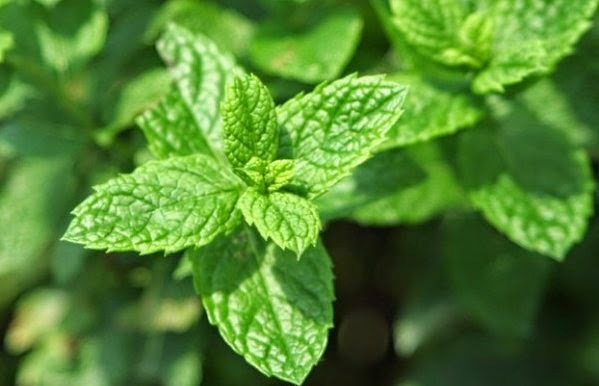 Boil for 1 minute until the liquid thickens slightly and then add the chopped mint. Turn off the heat, let it sit for 10 minutes. Pour it into a serving jar and refrigerate until required. Simply add some chopped scallions, salt, a little white pepper and some real butter to well mashed potatoes, to make Champ Potatoes and serve it piping hot, with your Roast Lamb! Enjoy & Have a Peaceful and Happy Easter! The International World Steak Challenge is back bigger than ever for 2019 and it's being held in Ireland! Global Meat News has launched its annual global challenge to find the world’s best steak and this year the competition moves out of London to take place in Dublin, while the robust expert and consumer judging process and Awards announcement is extended across two days. 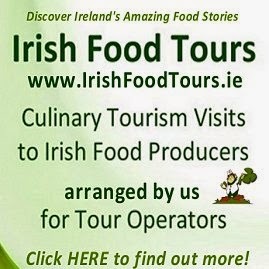 The change of location to Ireland follows the confirmation of Bord Bia, the Irish Food Board, as official host partner for the 2019 challenge. Now in its fifth year, the World Steak Challenge is designed to benchmark the quality of beef production against international competitors. The World Steak Challenge enables steak producers and suppliers to test the quality of their steak production against all international competitors. It will also provide an opportunity for entrants to engage with consumers to celebrate the joy and benefits of eating steak as part of a healthy balanced diet and highlight the quality and standards of steak production around the globe. This year, the competition judging takes place on July 9 and July 10 and will be hosted by the multi award-winning FIRE Restaurant and Lounge. The awards ceremony itself is on July 10 in the Round Room of the Mansion House, the official residence of the Lord Mayor. 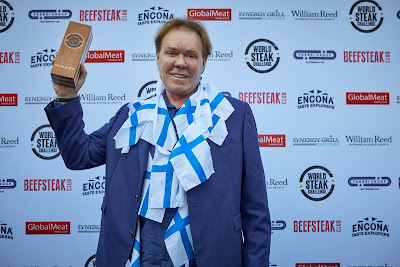 Farmer, Atria Finland from Finland, who won Best Grass-Fed and Best Sirloin in 2018. The 2018 champion was a grass-fed Ayrshire produced by JN Meat International of Denmark. The steak, which was reared by Atria Finland in Finland, won Best Grass Fed and Best Sirloin in the annual challenge. In total, an expert panel of 33 judges awarded 45 gold medals, 37 silver and 54 bronze medals. Will a superb Irish Ribeye Steak take the title in this year's World Steak Challenge 2019? With Valentines Day just around the corner, I thought I'd share a very simple yet delicious recipe, that you can make easily at home with the kids or for that special person in your life! 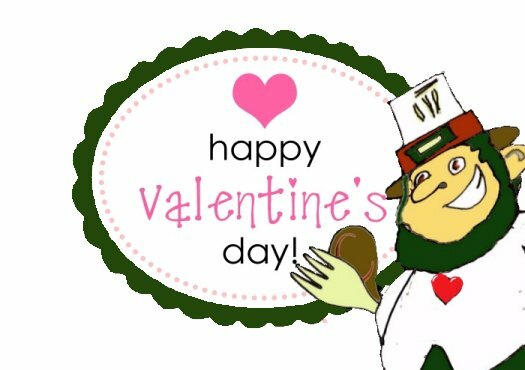 Taking the time and effort to make this yummy Valentine treat is a lovely way to show someone just how much you really care! Cooking something yummy for the One you Love can bring more happiness than buying it! 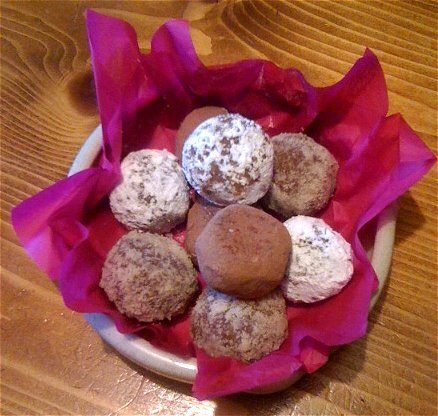 These little home-made Chocolate Truffles are so easy to make. Beautifully balanced with a hint of bitter coffee and sweet Irish Baileys Cream, these rich little delicacies melt in your mouth. They taste divine and the secret ingredient is simply that big dollop of Tender Loving Care! Cocoa Powder, grated Coconut, ground Almonds or any nuts, or Cake crumbs etc, for coating. 1. Melt chocolate together with the cream. You can do this in a bowl sitting over a pot of simmering water. Don't let any water get into your chocolate or it will go into a masse from which there is no return! You can also melt the chocolate, very slowly, in the microwave. Give it 30 seconds and then stir, 30 seconds and then stir... until it is melted. Don't let it burn! 2. Take the chocolate off the heat. 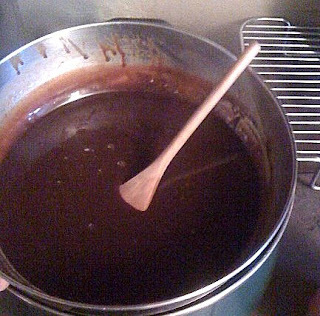 Mix together the cocoa powder, cold coffee and Baileys and quickly stir this liquid mixture into the melted chocolate. 4. Cover the bowl with cling film and put it in the fridge until cold. This will take 1 hour or so. You can leave it overnight if you wish as you long as everyone can avoid the temptation to steal little spoonfuls! 5. Give the mix a good stir with a wooden spoon before you start to measure it out with a warm teaspoon. Dip the spoon in hot water and always dry it before scooping out the mix. 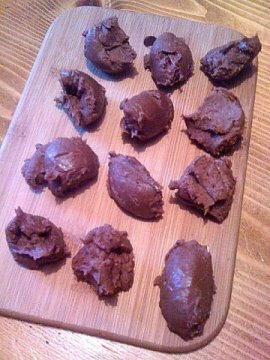 When you have them all done, roll them with your hands, into little balls and refrigerate again for 1 hour. 6. Finally roll your Truffles in the coatings of your choice. This is best done by having your crumbs, cocoa, almonds or whatever all sitting in separate soup bowls so you can literally 'roll' the ball around in the coating. Simple, yummy, great to make with the kids if you have some and gone before you know it! 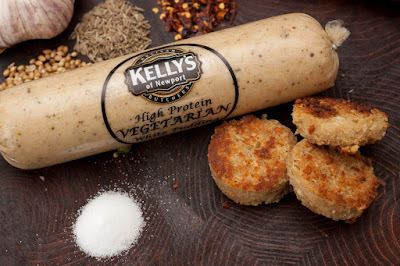 Kelly’s Butchers, in Newport, County Mayo, are well known for their award winning black and white puddings and for their sausages. 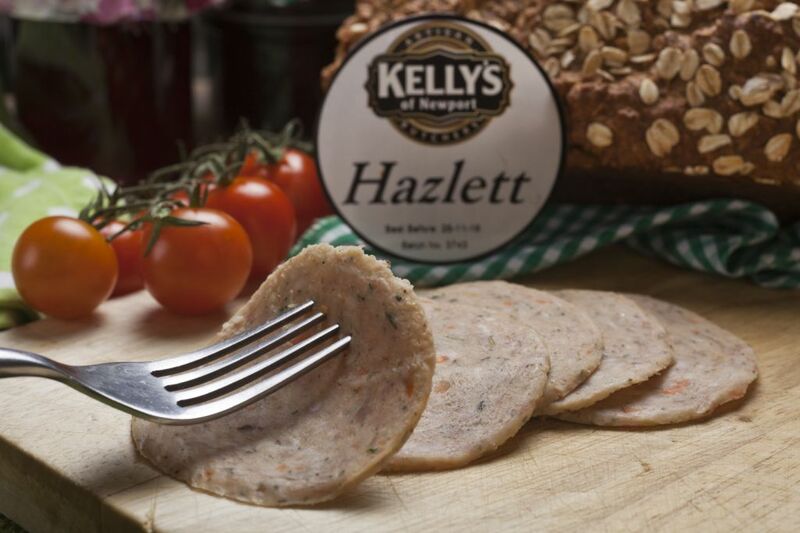 They recently launched two new products - Kelly’s Vegetarian High Protein Pudding and Kelly’s Hazlett. 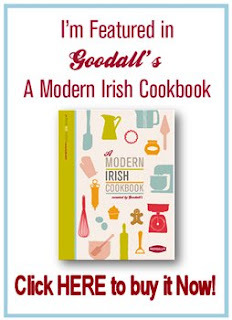 Both products were prize winners at the Blás na hÉireann Irish Food Awards. Why would a butcher make a vegetarian breakfast pudding? 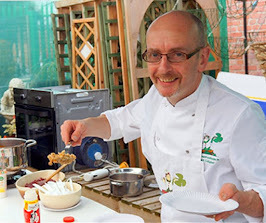 "It’s simple really," says Master Butcher Sean Kelly, "Our customers kept asking for it!" A cooked breakfast is a tasty treat and a great start to the day. However the vegetarian breakfast plate has looked a little empty in the pudding department, but now Kelly’s Butchers have the answer – the delicious Kelly’s Vegetarian High Protein Pudding. Kelly’s have used their years of practice to create a clever combination of spices with a soya base which gives a great texture and an exceptional flavour experience. 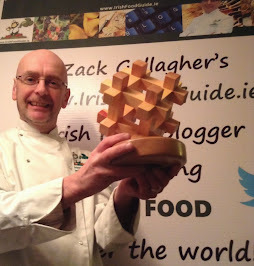 No wonder it was a Silver Award Winner at the Blás na hÉireann Irish Food Awards! Kelly’s Vegetarian High Protein Pudding is available in 280g pack (known as chubbs in the trade) which is exactly the same size as Kelly’s traditional Black and White Puddings. It’s been quite a while since I tasted "Hazlett", an old-fashioned traditional pork meatloaf. Kelly’s Butchers are always on the lookout for something different and have decided to reintroduce this family recipe. Fresh leeks, fresh carrots and a secret blend of spices have put a modern extra bite into this old favourite. Hazlett was traditionally used as a sandwich filling, or cut into chunks and served in a salad or with pickles and cheese or you can cut it thick and grill or fry it like a pudding. It's also packaged in 280g chubbs. Kelly’s Vegetarian High Protein Pudding and Kelly’s Hazlett are available in Kelly’s Butchers Shop, Newport, Co. Mayo and via the website along with many other products that can be purchased online at www.kellysbutchers.com.